Log cabin doors reflect the personality of the builder. Handmade log cabin exterior doors are the final touch to your handiwork. There is nothing worse than seeing a hand built log cabin with metal doors and plastic trim. There are many choices of styles and wood types. White oak and white pine will hold up nice and look great. The thickness should be between 1 and 2 inches. A 2 inch door will be heavy but also make a statement. Early cabins had cross battens over vertical boards. The vertical boards were nailed with many nails to prevent sagging. Later cabins used the Z-pattern bracing. To avoid drafts these boards were sometimes tongue and groove or ship lapped. This can be done with a Stanley #49 plane. This is a lot of work but worth it in the end. An extra touch is a felt strip around the door and jamb to block wind and cold. If you make your own log cabin exterior doors, be sure to coat them with at least two coats of spar varnish or polyurethane. This will help to prevent warping. Modern log cabin doors can be purchased in many styles to fit a need or theme. I have seen hand carved modern doors that are beautiful. These nice new doors will also have a big price. Hinges and hardware started as wood and leather. 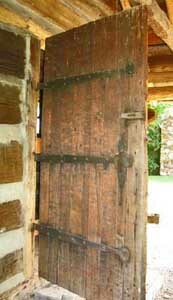 Wooden hinges were greased with lard. These were eventually replaced with forged metal hinges. Strap hinges work well and look the part. Usually three strap hinges are best. The common door latch would have been the Norfolk latch or the Suffolk latch. Both of these are excellent choices that add a touch of individuality and character. Both work on the same principal of the thumb lever. The only difference is the Norfolk has a backing plate and the Suffolk is one big bent handle. If you lack the skills or resources to make your own hardware a local blacksmith can be found and commissioned for a decent price. If this is not an option, try ebay. When security is a concern a modern dull black finish deadbolt can be added.